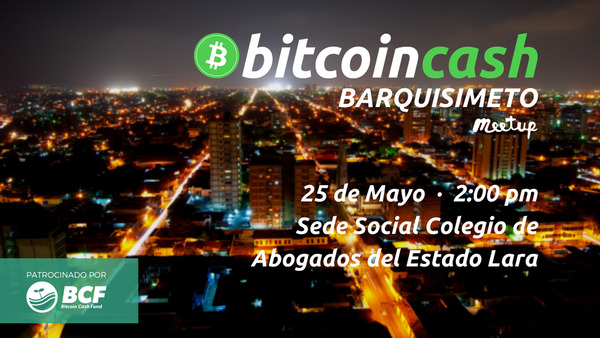 Production of events in Venezuela "Experiences of a Bitcoin Cash Fund Ambassador"
My name is Roberto Garcia, more than 4 months ago when I saw the advertising of the ambassadors in the different cities of the world, I realized that in Venezuela they had made a meeting of bitcoin cash in Mérida, Venezuela, and I was able to contact Mr. Cody who is a member of the BCF team. For me as a Venezuelan wanting to fight to stay in my country and help my family and know the cryptocurrencies for 4 years I saw that it would be an opportunity to perform such roles in Venezuela, since in Venezuela the meetups had not been held in the cities of Barquisimeto, Maracaibo and Valencia, which are cities with a great economic movement. I sent an email to Mr. Cody, I told him that I was knowledgeable about the subject, and that he was in favor of promoting Bitcoin and making his value return again to more than $ 15,000, I showed him part of my experience as a professor of Speech , Law and organizer of events in my University. and after 2 days she kindly told me that she would like to join the team, she put me in contact with Monica who is also a member of BCF what is now BCA, she showed me the way to Discord and showed me how meetups are done in all the world, I told him that in Venezuela we would have an opportunity for BCH to have adoption, we were also learning together how Venezuelans would adopt the use of cell phones, access to the Internet and their ability to adapt to the digital economy, were difficult times and to this day it seems incredible to me how many Venezuelans are beginning to show interest and curiosity with the use of cryptocurrencies to solve the current economic crisis. I was very worried about the fact that in Venezuela in a few places there were changes from BCH to Bolivars and if there is something in Venezuela that is a problem are the finances, the points of sales had failures, and everything had to be done using traditional banking, through transfers, there was no cash in the streets and also few people showed interest specifically in Bitcoin, the distortion had been created by the Venezuelan government's announcements regarding Petro. I could not change the bch to Bolivars but in a stroke of luck an ambassador of acarigua explained to me that in the Airtm platform they could change to Bolivars, then I managed to change the bch that I had and pay for the complete production of the first meetup in Barquisimeto. More than 4 nights without sleep and many calls to coordinate the place, sound, video, internet, advertising, etc. finally when the day arrived, for things of the destination that day there was transport protest and a great storm in the city of barquisimeto, more than 70 people confirmed attendance but approximately 45 people were able to attend. I remember that the person who contracted for the photographs never came and I had to ask a person on the spot to take pictures, but that person's camera did not have good quality, live I had to admit that my cell phone did not have the capacity to download a BCH wallet and I promised to send them their first BCHs by email. It was a battle but I was able to achieve it, besides that many people with businesses were interested in following bitcoin cash to learn more. I remember that I did a meetup outside the sponsorship of the fund in a smaller place using the funds I still had, but the same problem of the photograph was presented the person could never get. and the attendance was approximately 15 people. Another meetup that I made together with the BCF was in a nice hotel in the city, 40 people attended it was a success but there were questions that I did not expect. In regard to cryptocurrencies, Venezuelans had heard of illegality and extortion by government soldiers. In the development of the meetup the assistants shared with me their bitcoin cash enthusiasm but all preferred to keep their identity "for fear of the dictatorship". Venezuelans who want to learn and are curious about cryptocurrencies at the same time are afraid to make it public, they prefer to make money without anyone else knowing. Something very important is the love for the "dollar fiat" in Venezuela. 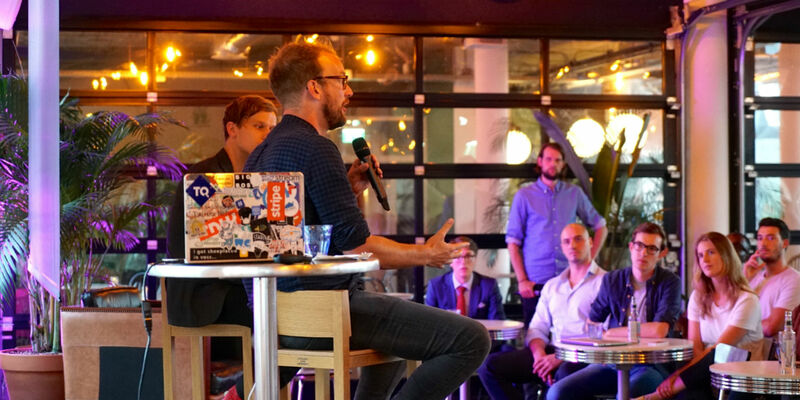 People knowing about cryptocurrencies immediately associate it with easy dollars to change to Bolivars, this as a way to protect their money in the current crisis, that is why in meetups it is necessary the work not only informative but also psychological, it is difficult to explain that cryptocurrencies offer true financial freedom; And this last supposes a philosophical and socioeconomic understanding that for many is difficult to understand. In that last meetup I was able to meet two soldiers who wanted help regarding the use of bitcoin mining, and another person told me privately that he was being extorted because he was trading at home. In Venezuela you must educate people in Law, Technology, Psychology, Economics, Society, Geopolitics, Banking, and Cryptography. After these issues we can talk about the operation of Bitcoin. It is very difficult to hold events in Venezuela, it is also a risk job, it has always been, I have been doing oratory courses for 8 years and we must gather many elements so that a event is successful. The social and economic crisis in Venezuela also affected the time and turned it into an asset, a rental hour anywhere equals 50 million Bolivares or 5 dollars currently, besides that you have to add video and sound 5 dollars more, there are places cheaper but do not meet security conditions necessary for attendees, the problem of transportation difficult to get a strategic place, I remember that in my first meetup walk 10 blocks to get to law school; In addition to all this, it is necessary to be in constant communication with the event salons where workshops are held, since in view of government announcements after 24 hours the prices may change and increase up to 500%. If performing events is something that everyone can do then it would not be a lucrative business, for something the companies that are dedicated to this are the most profitable. Venezuela still maintains places that could become workshop halls, cafes, restaurants, and above all ventures that want to be known, the call to these places help to move the cash flow that also helps clients to other places. The exit to this is to be creative and very patient, public relations help a lot, it is also better to do a meeting with 20 people than one with 50 or 60 to save on expenses and the quality of the event is maintained. Workplaces are an option, perhaps work offices, places such as the institution's conference room can serve, private school classrooms, frequent restaurants, and churches of religious congregations. Any idea where you can gather more than 20 people is valid. theaters I remember having told Monica from the BCF team that there was the possibility of a meetup in the movie theaters, and it seems an extraordinary place to do it, in fact in a meeting of ambassadors I made this same proposal and it is another valid recommendation for ambassadors, movie theaters are not only a comfortable place, but they also offer technology, video, and much-needed facilities. It is also evaluating the possibility of charging tickets to bitcoin cash events, especially in Venezuela where prices change daily this would also be a good option. In Venezuela and anywhere in the world the call, advertising and places of events are difficult, but with creativity can be solved, provided that there is constant communication and business is done with serious people. We will continue fighting for Venezuela to have a special place in the business and the promotion of bitcoin cash, there are very good surprises and alliances that will leave you surprised. Thank you very much to those who took the time to read this article, if you consider that I deserve a vote I will I would really appreciate it, but the most important thing is a comment that helps to know about other experiences. greetings to all. We continue working for Venezuela. Thanks for the hard work. Freedom knows no borders.